Honestly, I don't know where the summer days go. They seem so long and hazy-dreamy while we're in the middle of them, and then all of a sudden, the calendar says we're in mid-August. (Pretty sneaky, if you ask me.) I didn't even realize that three weeks had whooshed by since my last post here. In my defense, I just finished a blissful month of teaching two Soul Focus e-courses so I've been happily preoccupied. I already can't wait to run both of the courses again (not 'til January, though). We spent a lovely weekend with good friends in upstate New York. They live in New York City, so I was especially amused when one of them casually remarked while sitting by the pool, "What's that cow doing, walking through the yard over there?" It was a black bear! In her defense, whenever I've seen a black bear (three times now), I can't think straight either. Seeing a bear in real life is just *never* going to be a normal occurrence. The bear was oblivious to us (thank goodness!) and lazily lumbered off into the woods. Anyway, I just wanted to pop in, say hello at long last, and share some of my favorite summer snapshots with you. We still have a few weeks left, and believe me, I fully intend to stretch out those summer days as long as I possibly can! Happy weekend to you, friends. I hope it's a beautiful one! P.S. You can get my free downloadable guide, Hey, How Did You Do That?! 20 Apps to Totally Transform Your Phone Photos, when you sign up below for Writing with Light (my monthly-ish personal letter delivered straight to your inbox, featuring my latest creative inspirations, upcoming e-courses with private discounts, and no spam, EVER). Give it a whirl! The lazy, hazy days of summer are finally here and I, for one, am VERY happy about that! Today, despite my admittedly daunting to-do list, I'm taking the kids to the beach for the first time this season, and I'm quite excited to simply stick my toes into the warm sand and await the "salon treatment" of cool mud from a beach bucket mixed with lake water. (If that doesn't sound good to you, you haven't tried it yet!) I'm downright terrible at relaxing, but I think my kids have perfected the remedy. There's something so heavenly about the way a beach muffles the sounds of the world. Everything seems so far away. Little kids yelling seem like they're yelling from Mars. The insignificant stuff washes away with the waves. Whoever said "Life's a Beach" really knew what she was talking about! My Summer Garden Tour: Can You Identify These Flowers? I hope your summer is a very cool one! Come say hello to me on Instagram! 20 Ways to Simplify Your Summer, "Old School" Style! If I had to choose just one symbol of summertime, it would be our Rose of Sharon bushes, which burst forth in a festive show of pink blossoms around mid-July and keep up their boisterous celebration until the first chills of September. They are gorgeous, each and every blossom. They keep me busy behind the camera. It's impossible for me to go out the front door and not be beckoned towards them. They're intoxicating, and the bees agree. The blossoms are havens for little creatures, gathering places to meet in secret, between the pretty petals. It's in the very last days of summertime that these Rose of Sharon bushes surround us as if to say, "Surrender!" They climb up our window panes to peek inside, climbing so high that we think they'll reach right up to the tops of the windows, on their way to the rooftop. And so it goes: The Rose of Sharon begins to fade. The vibrant and voluptuous pink blossoms turn to a soft purple; they wither and fall, taking their last curtain call. Even in their withering, there's a delicate beauty. Usually, just as this slow descent begins, a gardener comes 'round to trim down the bushes with a noisy electric hedge-trimmer. This year, I couldn't bear to think of that harsh sound of shearing, piercing the peacefulness of these final afternoons of summer. So I lugged out our ladder and began to clip the last of the fading blooms myself, quietly snipping with garden shears, amassing a pile for the composter. My daughter gathered up the still-vibrant stems and carried them inside, like fragile dolls. I told her she could arrange her own bouquets around the house. She was thrilled at the prospect and set right to work. She took the task very seriously. I recognized in her my own determination to get the details right, to create a pretty picture, something to hold onto. And through it all, my camera recorded these final moments of summer, knowing all too well they wouldn't last. Summer went much too fast, didn't it? It seems we say it every year. Perhaps because it's always true. And whispers once more her farewells--"
P.S. 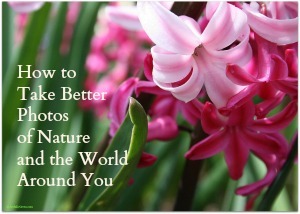 My photo e-courses will be running again in October and November--details coming soon! Well, this little leaf tells the whole story of the first weeks of September, doesn't it? Perched halfway between searing summer and crisp fall. The beaches are closing, but the schools are opening. Peaches and plums are on their way out, but the apple trees are growing heavy with fruit. September is the Middleman. 2) The Bahamas are (sort of) eco-friendly. As you can see in the top photo, the beaches of the Abacos are pristine and relatively litter-free, but oddly, I saw no sign of recycling during the whole trip, aside from (maybe) one trash bin (possibly) for bottles. It felt weird and wrong to throw out cans and bottles with the regular trash. Bahamians are not "un-green", though. Look at this playground in Hope Town, pictured below, that was built around a tree instead of cutting it down. How cool is that?! 3) The spiders in the Bahamas have their own Halloween costumes! I learned this red spider with the crabby "face" on its back (to fool prey) is called a Spinybacked Orbweaver. It's harmless to humans, which is good because I was getting "up close and personal" to snap pics! 4) Sharks hang out at the docks. I've seen two sharks "in the wild" before, both in the Bahamas, and both times, they were in shallow water right below the docks. I'm not talking about Great White "Jaws" type of sharks. Just small ones--nurse sharks or dogfish. We also saw a couple of sea turtles! 6) To get your "land legs" back faster, take long walks, ride a bike, or drive. There's a weird physical sensation that can happen after you've been on a boat for an extended period of time. For hours or sometimes days afterward, you feel like you're still on a boat, with your world gently rocking back and forth. My husband (a die-hard sailor) loves the effect, but I was getting dizzy just sitting still in a chair. (I'm still feeling the occasional boat-rocking, two days later.) Looking around the web for answers, I found out that the more you move around on land, the quicker your body will readjust. Good rest also helps. I kept myself moving the first day home by unpacking the bags, straightening up the house, and giving Delilah extra-long walks. (I missed her velvety ears so much while we were away.) Then I took a nap! All in all, it was a great trip--hot and cool at the same time! Your turn: What's the most educational trip you've ever taken? Let's hear it in the comments section below--I'm all ears! Did you enjoy this post? Get more like it by subscribing (upper righthand column).